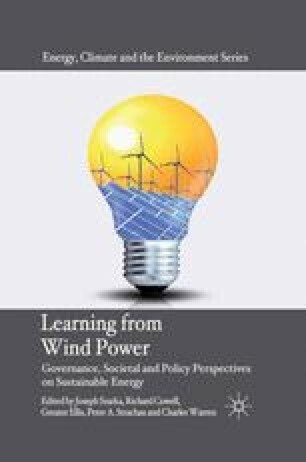 In a recent review of lessons learned about wind power planning, Ellis et al. (2009) pointed out an emphasis on procedural efficiency, on barriers occurring from planning practices, and a downplaying of the qualitative understanding of planning processes. Planning is often seen as the origin or the carrier of the wind power problem (for example, CEC (Commission of European Communities) 2005; Wolsink 2009). This chapter argues that it is worth reversing this perspective. While the ‘planning problem’ results from a widely shared perspective of procedural efficiency, this is often framed in a perspective of ‘technological potential’ — that is, the potential (installed capacity) of a technology that could be achieved in the absence of social obstacles to its deployment. Definitions of technological potentials have been debated (Verbruggen et al. 2010). But beyond these debates, technological potential indicates the potential of an a-social technology, in the sense of a technology, which when deployed, fails to induce friction and leaves the social realm unchanged — in other words, a technological nirvana. The problem, as developments in Actor Network Theory (ANT) have made clear, is that technologies would not exist in such a nirvana. Technologies are assemblages made up of heterogeneous elements: human beings, non-humans, technical artefacts and so on. According to some physicists, there is not enough mass in the universe to balance the accounts that cosmologists make of it. They are looking everywhere for the ‘missing mass’ that could add up to the nice expected total. It is the same with sociologists. … When adding up social ties, all does not balance … the society they try to recompose with bodies and norms constantly crumbles. Something is missing … Where can they find it? Everywhere, but they too often refuse to see it in spite of much new work in the sociology of artefacts. BirdLife International (2005) Position Statement on Wind Farms and Birds, Adopted by the BirdLife Birds and Habitats Directive Task Force on 9 December 2005, http://www.birdlife.org/eu/pdfs/Nature_Directives_material/BHDTF_Position_Wind_farms_and_birds_2005_12_09.pdf, accessed on 15 August 2011. PNRNM (2003) Charte du Développement Eolien — Projet de Parc Naturel Régional de la Narbonnaise en Méditerranée (3 cahiers), Parc Naturel Régional de la Narbonnaise, en Méditerranée, November, at http://www.parc-naturel-narbonnaise.fr/en_actions/maitrise_de_l_energie_et_energies_renouvelables/charte_eolienne.